Is it Already the 5th Week of School? After we finished up prime factorization we reviewed GCF and LCM. My favorite method is the ladder diagram. It's super simple and works for both! You can find these at my TpT store in several different formats and bundles. After GCF and LCM we reviewed adding, subtracting, multiplying and dividing fractions. 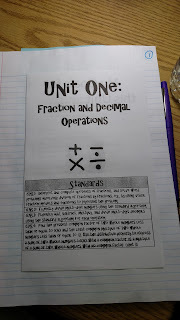 Many of my 6th graders lack fluency in fraction operations. Many continue to struggle. All of my unrated products free for 24 hours! For 24 hours I have changed all of my unrated products to free. To take advantage stop by my store and download my free products. Don't forget to rate my products to earn your TpT credits! Everything on TpT on sale! Most foldables marked done to $1! Wow, what a busy week! This week we set up goals on our Unit 1 Standards sheet. I explained to students how we will use this to start each unit. Students set individual goals and looked over the standards and "I Can" statements for the unit. They can use this as a checklist as we go through the unit or as a study guide when preparing for a test. I explained how the data table will work. After assessments students will chart their own data with the goal of reaching mastery for each standard by the end of the year. Any standard not mastered will be continuously worked on. Next we looked at the Sieve of Eratosthenes and reviewed prime and composite numbers, factors, and multiples. They enjoyed learning about this historical tool. I spent yesterday (yes, Saturday) at school desperately trying to get my room ready for my new students. I arranged my desks and figured out how I'm going to seat 33 students with only 26 desks. 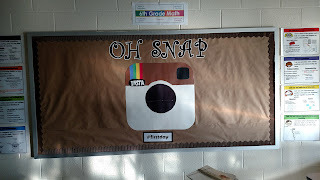 I ran copies for the first week, I perfected another bulletin board. I made seating charts and checklists for those pesky signed papers that need to come back. I have a bunch of things still undone but I am ready enough to get through the first day. I am excited for the start of a new year. Starting Monday I plan to share daily as we add to our interactive math notebooks. I hope that this can help teachers who have not used interactive notebooks before or who are new to 6th grade math. Please feel free to comment with any suggestions you might have as well, improvements can always be made! 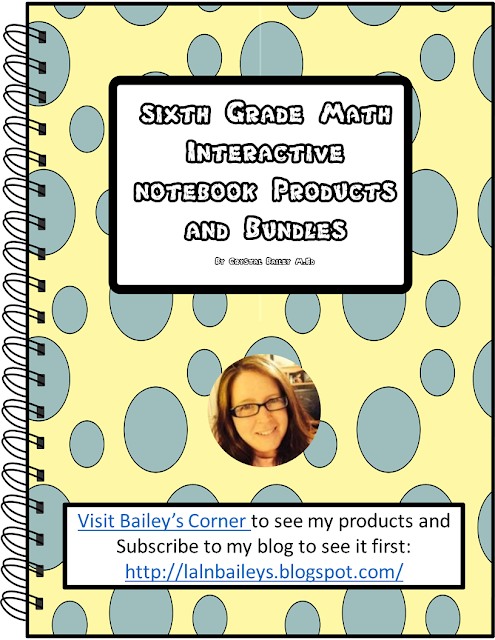 I am getting more and more products loaded in my Teacher's Notebook store! Follow my shop to get weekly freebies! In honor of my newly updated Teacher's Notebook store I am offering my 6th grade statistics foldables in a flash freebie bundle. Please download and rate me! I will be adding 80 more of my 6th grade products over the next few days.